cumulus in the background. Try your hand at cloud identification. It's fun! Would you agree these are cirrus duplicatus? Northeastern birds tell the season. The starlings are gathering in flocks. 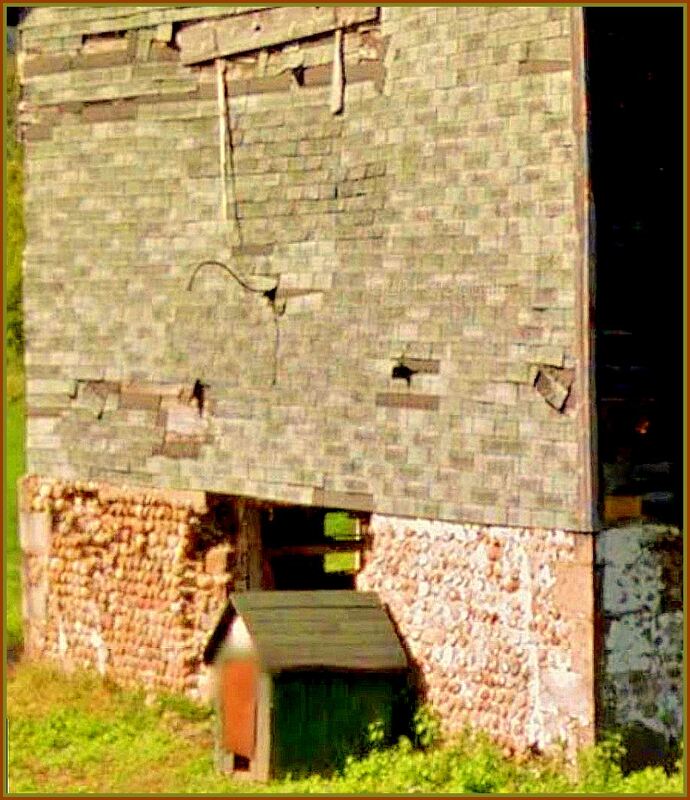 remains of a once busy Herkimer dairy farm. A quiet day on the NYS Barge Canal, Lock #19. Notice the flood control structure at 2 o'clock, on your right. This is new construction. Tug 44's web page provides close-up photos of these features. Teachers! This is an opportunity for you to use Google Earth 3d to your advantage in the classroom. The basics of canal design can be demonstrated by looking at these satellite views of Lock 19 and its vicinity. In the view above, the camera is looking west. Water flow is from right to left and from the top to bottom. How do you know that? (Your students may ask.) Look for the white of water flowing through the lock gates near the center of the picture and the white water flowing over the flood control dam where Sterling Creek joins the canal. Water flow through lock gates is normal. Some are more watertight than others. Why bother spending money to build a dam at the mouth of Sterling Creek? The object, it would seem from the geological evidence you can gather via Google Earth, is to prevent flood damage to the canal and its structures. What geological evidence? Let's take a look. because the floods are frequent enough to prevent plants from growing very much before they are washed away. The gray marks the width of the stream in flood compared to what you see here. In the foreground, just beneath the water, bedrock! Sterling Creek's flooding has exposed a layer of solid shale (?) beneath ten feet or so of assorted boulders, soil, etc. known as glacial till. The Creek has carved out both banks. Can you imagine its power in flood! as to the length of time between floods. My guess is every two or three years, as they look like mostly annuals, though I do see some more substantial small shrubs and trees in the background. Sterling River when it is in flood. Ah! The beauty of atmosphere! Photo processing has brought out a hint of blue to the shadows on the photo above. Daytime shadows are not pure black. They reflect the color of the sky. In this shot, there's a blue tint to the stream in spots, too. 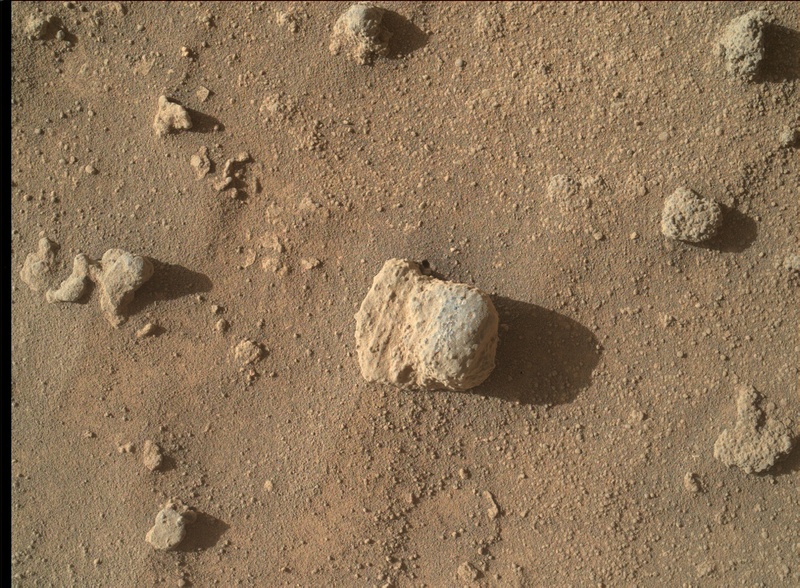 On Mars, you probably noticed from the NASA photos that shadows have another color. There are no black shadows on Mars, either! 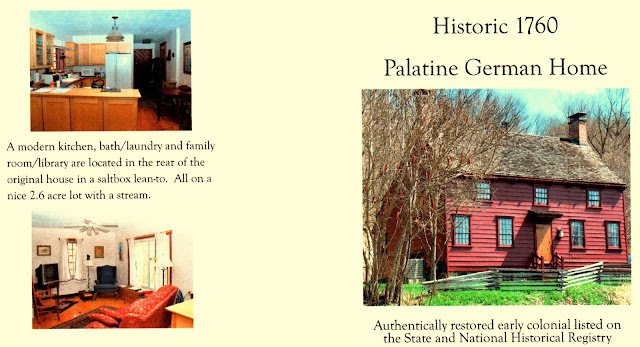 A historical marker confirms that this is the Palatine German Frame House as listed in Wikipedia. 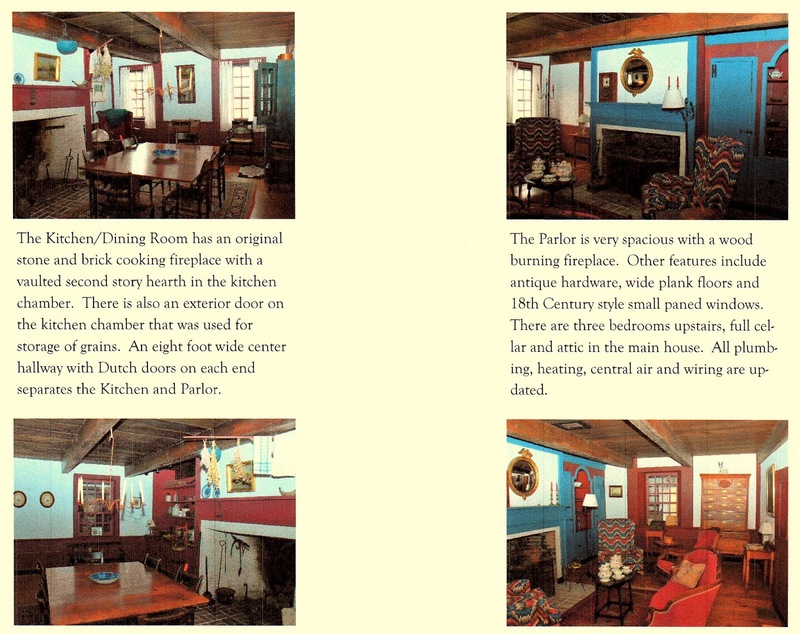 Interior shots of the Palatine German Frame House were printed as part of a sales brochure published by Century 21, Rob Diedrich Associates, Mohawk NY. Although this property is not for sale at this time, similar fine properties can be found by contacting this local realtor. A CSX caboose at rest. ...unless you take a trip a few hundred miles south to Strasburg PA. There you will find a whole motel full of cabooses you can stay overnight in, a rail museum and other sites of interest to railfans. The video below briefly tours a motel made up of cabooses from a great variety of American railroads. to the many lives that once called this "home." A marsh is often at its best at sunrise or sunset. Utica marsh is no exception. Picasa brings out the colors of this 9 eyes shot from Route 5 in October 2015. Purple loostrife marks an earlier pass of 9 eyes. Bisected by a railroad and a former railroad siding, the Utica Marsh is on your right. The light blue on this Google Earth view marks roads on which Google Street Views are available. This area has an extraordinarily fascinating geology. Aside from the Marsh itself, the Mohawk River beautifully illustrates characteristics of a river in "old age," meandering across a flat post-glacial plain. The scars of former river channels include among them an "oxbow" lake on the left. As a whole, the picture shouts back to the observer, "water, water, everywhere!" It appears from the Google Earth view that the Marsh had a more circular shape before it was penetrated by canal, railroad and highway construction. My guess is that the marsh is what remains of a "kettle" lake formed by the continental glacier when a huge landlocked iceberg was left behind by the retreating glacier. This mammoth chunk of ice buried in the glacial till eventually melted, leaving a hollow filled with glacial meltwater--a lake. Since its formation, the lake has been filled with sediment, both natural and man-made. But that's only a guess. You can read more about the Utica Marsh on the Utica Marsh Association home page or the NYS DEC page featuring the Marsh. One of the most obvious needs for canal construction is to eliminate rapids that would otherwise prohibit the passage of boats. Google Earth demonstrates another advantage. The NYS Canal System here parallels the NYS Thruway in a straight, businesslike line. Can you imagine the time the Canal saved over boats navigating up the wandering Mohawk River! I got lost in Utica. Just trying to follow Route 5 proved to be a great challenge for me. Either I missed much of what there is to see along 5 in Utica, or my head got lost in the clouds, of which there are plenty in central New York southeast of the Great Lakes. The same stretch of canal at North Genesee St., Utica in November 2015. Lowering stratus could mean an approaching cold front and the area's first lake effect snow. derived from grass long before the European colonization of the Americas. Teachers! The brief video below is a most informative and easily understood explanation of the origin of corn. HHMI Biointeractive provides additional resources for classroom use. Follow the links below for additional information. "Popped Secret: the Mysterious Origin of Corn"
Just Like Grandma's antiques, etc. device for lifting loose hay into the hayloft. The future looks uncertain for this distinctive Vernon building on Route 5. The storefront may have been altered from the original more than once. My guess is that this sturdy building was once someone's pride and joy. just the right colors for this building. A volunteer at the Oneida County Historical Society has kindly provided further information about the building above and its hitching post (below). "During the 50's thru the mid 70's,the building was owned by Frank P. Sansone. It was known as " Sansone's" and was a men's clothing store...a very classy store. They sold Jumping Jack men's shoes. Their advertisement read: where you find the best selection of men's suits, sports coats and slacks in central New York...tailoring done here to fit any man." Their advertisement was also attached by the phrase "by the Hitching Post." The hitching post is still in the front of the store. In the town where I live, I have found 3 hitching posts - same thing, so I cannot verify that they are original - or that some company went around selling them because they were attractive items. "...There might be occupied apartments above the store, but you are correct to assume the building is not kept well. I am not positive there is nothing on the first floor but there was a clock in the window that was running [purple] Mr. Sansone died in 2004. He established this business in 1947. "There was one article in the Rome newspaper that stated: "the Vernon Bank was established in 1839, ten years after the village [of Vernon] came to be by Salmon P. Case. In one corner of his store[now the Frank P. Sansone] he placed an iron safe in the wall and here business was carried on by the 'Vernon Bank.' Later in the year, the present bank was built and in 1865, it became known as 'The Bank of Vernon.'" You can tie up your horse now! A month's supply of seasoned firewood is ready for the fireplace. If not used soon, it will be compost. "...I knocked on the door of the nearest house located to that stone post. I noticed an additional stone [cement] about 20ft away but this one had a pointed top. This narrower post had a ring and chain still on it which indicates to me that it might have been part of a gate. Also in the distant opposite corner was a cemetery. The owner was gracious in showing me the cemetery and the following stuff I found on the Internet. The cemetery had a large iron fence surrounding it - two tombstones inside. "Charles J. DeFerriere 1804 - 1890" and Angel DeFerriere 1774-1853 and his wife Polly." "Polly Dennie [Denny] was the daughter of a prominent family in the region - her mother was an Oneida Indian; her father was French origin. They raised a family of five children. DeFerriere died in 1832 and his cemetery is not listed in any place that I could find. "The post that you showed me a picture of was the only one like it on the property which has since been divided into plots of land and sold. It is located quite near the highway, but highways change. There is the Cowaselor Creek nearby. It is also on a crest of a hill - called Deadman's Hill - the lady told me that many a carriage had accidents on this hill because it was much steeper in the old days. Our bushes & trees have not blossomed yet, so it was easy to find. My supposition is that it was one of the entrances to the property. "Somewhere in the area is another house [I didn't know this until I got home] It is called the DeFerriere House and is on the National Register of Historic Places [in 2007] It is a 1 and a half story, frame Greek Revival home." The DeFerriere Cottage is framed by Sugar Maples and Norway Spruce. Though it is on the National Register of Historic Places, it is private property. Winter is the only season this home can easily be seen by passing motorists. The residence is occupied and is not open to the public. The owner is using personal funds to maintain and restore this property. Please respect their right to privacy if you happen to drive by. As with all National Register listings, ample documentation and photos is provided as part of the original application for listing. This rear view from the Register of Historic Places application illustrates some of the unique features of this residence. Contrary to appearances when viewed from the front or sides, the building is not a square of uniform height, but a U with two wings that have shed roofs. Behind a pair of very plain doors on your left in this photo is the carriage barn. Excerpts from the original application for listing provide additional information about the contrast between the "public" and "private" faces of this cottage. The main DeFerriere residence was across the street and was torn down decades ago. Oneida ; 2089 Genesee St.